The Hue Vesak shootings refer to the deaths of nine unarmed Buddhist civilians on May 8, 1963 in the city of Huế in South Vietnam, at the hands of the army and security forces of the government of Ngo Dinh Diem. The army and police fired guns and launched grenades into a crowd of Buddhists who had been protesting against a government ban on the flying of the Buddhist flag on the day of Vesak, which commemorates the birth of Gautama Buddha. Diem's denial of governmental responsibility for the incident—he instead blamed the Vietcong—led to growing discontent among the Buddhist majority. The incident spurred a protest movement by Buddhists against the religious discrimination of the Roman Catholic-dominated Diem regime, known as the Buddhist crisis, and widespread large-scale civil disobedience among the South Vietnamese. On November 1, 1963, after six months of tension and growing opposition to the regime, generals from the Army of the Republic of Vietnam conducted a coup, which saw the removal and assassination of Diem. 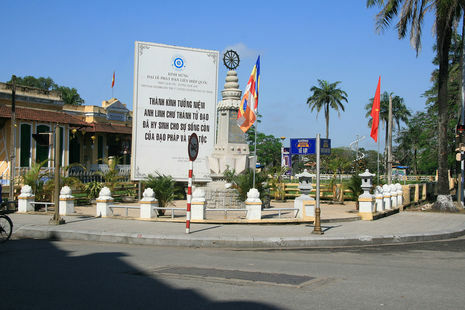 In June, as the Buddhist crisis escalated, Diem appointed Tho to lead a government committee to deal with grievances raised by the Buddhist community following the Hue Vesak shootings, in which eight Buddhists were killed by government forces while protesting a ban on the flying of Buddhist flags. The committee concluded that the Vietcong were responsible for the deaths, despite all eyewitness reports and amateur video showing that the government fired directly at protesters. The committee's whitewashing caused Buddhist protests to escalate. When de facto First Lady Madame Ngo Dinh Nhu mockingly described the self-immolation of Buddhist monk Thich Quang Duc as a "barbecue," Tho refused to condemn her remarks, saying that they were "personal opinions."